TAMPA BAY, Fla. (FNN SPORTS) – The Pittsburgh Steelers brought the aggression to a packed-out Raymond James Stadium Monday night, showing early on that a Bucs win wouldn’t come without a fight. The first sign was a Steelers helmet-first tackle during the Bucs’ first scoring drive, which wasn’t called, then the more overt hand-to-the-helmet shove-off by tight end Vance McDonald on Peyton Barber as he ran to the end zone, which also wasn’t called. In almost spiteful irony, the Steelers missed the extra point. 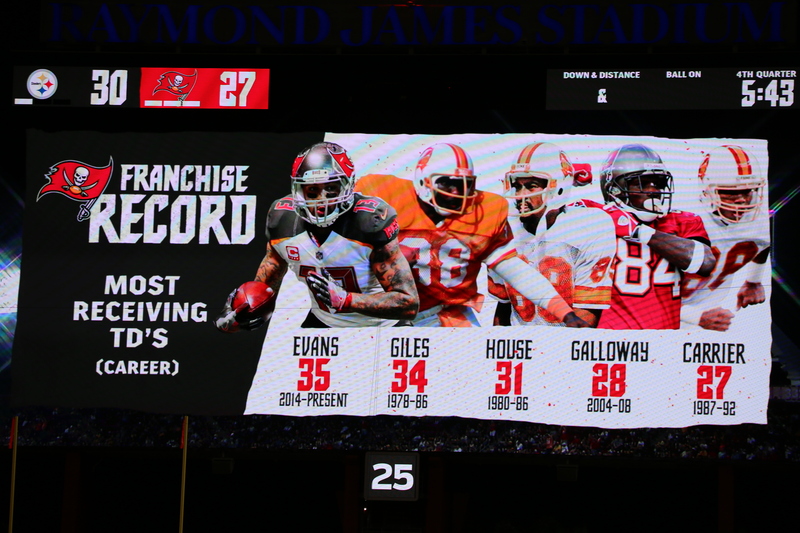 By then, the Bucs had already scored thier first touchdown with Ryan Fitzpatrick’s successful pass to Cameron Brate, making the score 7-6. Before the first quarter was over, the Steelers had three flags, including defensive tackle Daniel McCulliers being flagged for illegal use of the hand to the face, though the penalty was declined. For the Buccaneers’ part, Gerald McCoy was flagged for roughing the passer, resulting in a 15-yard penalty with less than a minute left in the first. Early in the second quarter, Buccaneers safety Isaiah Johnson made a dangerous crash into the wall in an effort to catch a touchdown pass. He was down on the field for a minute, but was able to rise and walk off. At the same time, Chris Conte was ruled out of the game due to a knee injury. The Steelers flipped the lead in their favor with a field goal in the first three minutes of the second quarter, bringing the score to 9-7. The Bucs took a hit when Peyton Barber fumbled the ball after completing his pass. Steelers cornerback Mike Hilton recovered the ball. On their next play, Ben Roethlisberger completed the 27-yard touchdown pass to wide receiver Antonio Brown. This time, the Steelers’ extra point attempt was good, bringing the score to 16-7. In continuing physicality, Steelers’ Jon Bostic grabbed Shaun Wilson’s facemask on the return, resulting in a 15-yard penalty, Mike Hilton next got flagged for personal foul on Mike Evans after the completed pass which was another 15-yard penalty, and the Steelers were next hit for holding. The Bucs lost their red zone opportunity when the Steelers deflected Fitzpatrick’s next pass, which led to an interception by Mike Hilton. On the Steelers’ next scoring drive, Jason Pierre-Paul was flagged for roughing the passer, resulting in a 15-yard penalty. 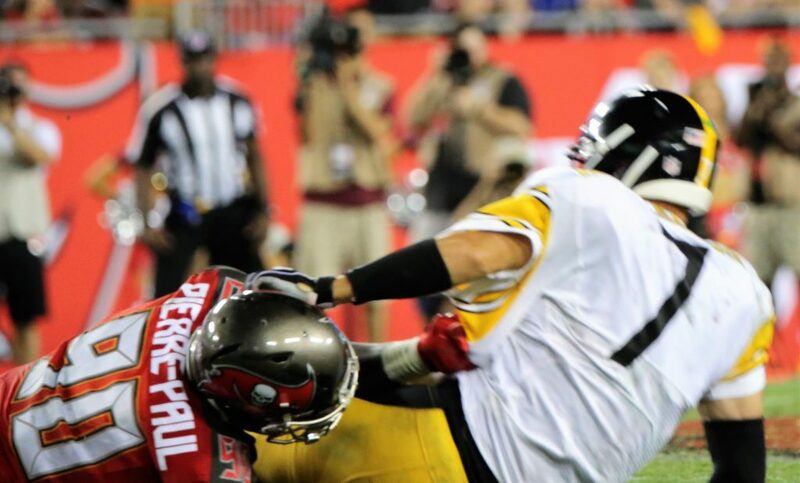 On the Buccaneers’ next scoring drive, the Steelers got flagged for roughing the passer penalty. Steelers safety Terrell Edmunds intercepted Fitzpatrick’s next pass, and Bucs’ McCoy and Curry got revenge by sacking Roethlisberger on the next play, while Jason Pierre-Paul sacked him on the third down. Fitzpatrick then threw another interception recovered by Dupree, who ran it 10 yards for the Steelers’ next touchdown, making the score 23-7 with less than two minutes left in the first half. While the Bucs managed a field goal, the Steelers widened the lead further by the end of the half with another touchdown on their next scoring drive, ending the half with a score of 30-10. All in all, Fitzpatrick had a rough first half, with only 11 for 21 in pass completions, 1 for 4 in third down conversions, 1 for 3 in red zone efficiency, three interceptions and one sack. Roethlisberger, by contrast, was 21 for 25 in pass completions, threw three touchdown passes, was 1 for 3 in third down conversions, with one interception and two sacks. The Buccaneers squeezed in another field goal in the third quarter, bringing the score to 30-13. 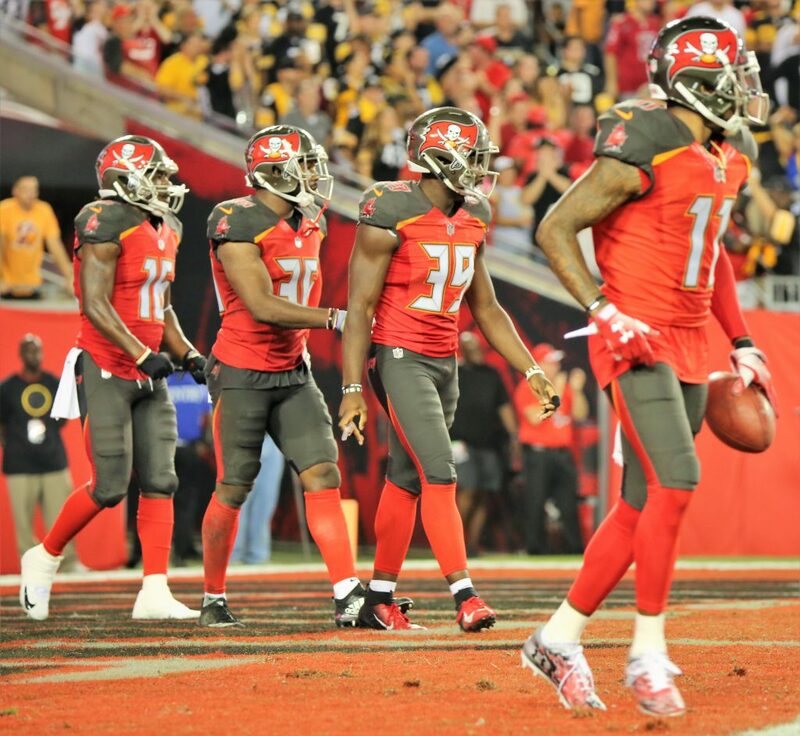 In the fourth quarter, Fitzpatrick put the Bucs back on the board with a four-yard touchdown pass to Chris Godwin, shrinking the Steelers lead to ten points, 30-20. DeSean Jackson ran the punt return 90 yards for a touchdown, but a holding penalty completely nullified the effort. Mike Evans made the repeat effort worthwhile, completing the 24-yard touchdown pass on the third down, bringing the Bucs within a field goal of tying the game at 30-27 and making franchise history for the most touchdown passes received (35). 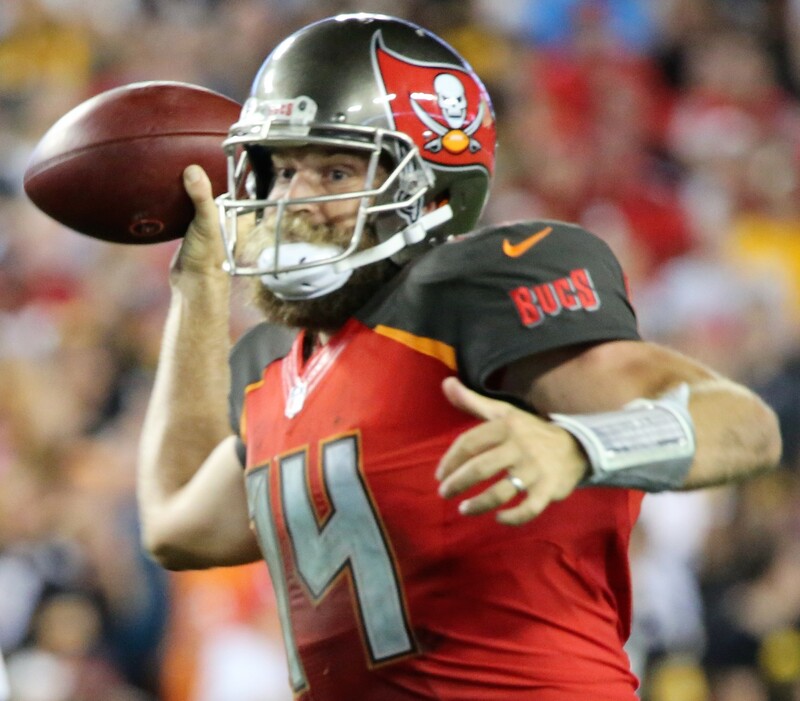 Fitzpatrick, despite his rough game, also made franchise history for the most passing yards. Unfortunately, however, the Bucs couldn’t close the gap, and the Steelers ended up defeating them with the final 30-27 score. The Buccaneers hit the road for two weeks to face the Chicago Bears then the Atlanta Falcons before returning home on October 21 to host the Cleveland Browns. The Pittsburgh Steelers return home for the next two weeks to host the Baltimore Ravens and the Atlanta Falcons.